Outlander moves the action to Jamaica when the Artemis finally arrives allowing Claire and Jamie to proceed with the business of finding Ian. The beauty of this show is that it can be a great many things without being jarring. Claire and Jamie are frequently removed from their comfort zone and forced to adapt to new social situations. 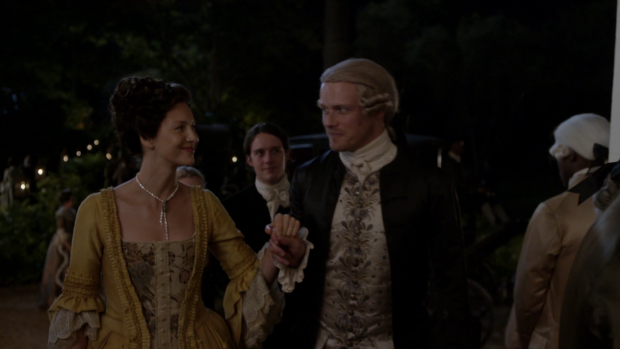 It’s less likely to feel like an adjustment for Claire considering when she comes from but Jamie has been party to many different scenarios that his upbringing and social standing wouldn’t necessarily allow. This particular episode is a callback to the early days of season 2 when Claire and Jamie were in France trying to figure out a way to prevent the battle of Culloden. Those episodes featured grand locations, fancy costumes and storytelling that had a more duplicitously political edge. This episode is a lot less political but the other two certainly apply. Once again the production design is first rate in this episode with many gorgeous backdrops and costumes. I’ve really enjoyed the departure from the norm the past few weeks. The seafaring plot has been a great success and getting a snapshot of life in Jamaica at this point in history is another intriguing idea that plays out pretty well. The episode doesn’t shy away from the fact that Jamaica is built on a foundation of slavery. It isn’t the focus of the episode but it’s certainly a part of it and the reminder of this fact is very powerfully handled. The way the slave trader completely dehumanises those he is trying to sell by referring to them as “product” and other such dehumanising terms is really jarring and this is reflected through Claire’s disgusted reaction. Jamie is forced to buy a slave in her name after she reacts violently to his treatment during an auction. Temeraire (Thapelo Sebagodi) becomes Claire’s property and raises a number of moral questions. The fact that Claire is against slavery is irrelevant because she is still keeping a slave. Some time is devoted to establishing that she and Jamie have the best of intentions as they fully intend to free him as soon as it is safe to do so but in the meantime for the sake of appearances Temeraire is Claire’s property. The moral question comes from whether it’s right to keep a slave in order to protect him. It is made clear that their ownership of him is temporary but it’s impossible to deny the fact that a slave is being kept by people who don’t believe in it. It’s heavily implied that Temeraire feels that he is their property until such times that it is made official that he isn’t. I’m not criticising what Claire and Jamie do in regards to their ownership of Temeraire as they definitely make the best of a bad situation and both communicate their unease with it but the underlying morality is distressing to contemplate. Temeraire’s role in the story was wrapped up in a really clumsy way. His presence in the story was for Claire and Jamie to receive important information on the whereabouts of Ian which he certainly accomplishes before being haphazardly cast aside. There was some mention of freed slaves being nearby but the whole thing felt really rushed. I can see why the character was introduced as slavery is a very real issue that existed at the time and it’s important to put a human face on that but the execution left a lot to be desired. The party sequence is where much of the episode comes together and Outlander indulges in this season’s favourite plot device; coincidence. Jamie does directly point out that it seems like ghosts from the past are drawn to them and suggests that Claire’s journey through the stones might be responsible for this but it doesn’t excuse the fact that contrivances have been responsible for moving the plot along this season. One or two coincidences to make things happen is unimportant in the grand scheme of things but the sheer volume this season has been overwhelming. Claire and Jamie are in a good position to find out the information they need because John happens to be the Governor of Jamaica and is still eager to do anything to help Jamie. It’s good to see David Berry back as his interactions with Sam Heughan are always interesting to watch but it makes Jamie look more lucky than resourceful when it comes to gathering necessary information. Another ghost from the past that appears in this episode is Geillis; she is introduced early on as the Bakra. Ian is sent to her and she emerges from a blood bath before proceeding to threaten and seduce him in equal measure. Lotte Verbeek is as captivating as she ever was and plays the scene with a certain enigmatic quality that suits both the character and her situation. The question of how she survived is left lingering and the way she dominates her interaction with Ian makes for great viewing. John Bell is also great in this scene; he strikes the perfect balance between playing Ian as visibly repulsed while also more than a little turned on. It’s clear that Geillis isn’t someone to be denied and there’s nothing he can really do. Her appearance later in the episode at the aforementioned party adds to her mystique in some ways but feels a little exposition heavy otherwise. The scene between Geillis and Claire was well acted but the detailed account of how she survived being burned at the stake. It would have been better had it been left vague as the explanation comes across as overblown. Geillis’ explanation of how she came to be in the position she is seems reasonable and the way she flips from being Claire’s ally to self serving works really well. The details around the prophecy about the next Scottish King being revealed when three jewels come together is a little too mystical for this show though I wonder if it’s a sign of things veering into a more fantasy realm come next season and beyond. I’m not sure how the books approach this but it would somewhat fit with the changing face of this show in general. The wording of the prophecy as said by Margaret “”When twice 1,200 moons have coursed, ’tween man’s attack and woman’s curse, and when the issue is cut down, the will a Scotsman wear a crown” is interpreted to mean that a Scotsman will wear the crown when a child dies at 200 years old on the day of its birth. “Man’s attack” is the sexual act that conceives the child and “woman’s curse” is childbirth and “the issue” is the child itself. When taken at face value it seems like nonsense as it’s impossible for a baby to be 200 years old in a conventional sense. When time travel is factored in then it is entirely possible for this to happen though the actual mechanics of it don’t quite add up in my head. As far as I can tell if a child is born in the 20th century, travels back in time to the 18th then travels forward in time to the day of their birth then they would technically be 200 years old while also being a baby at the same time. It’s all very confusing but I suspect the next episode will work to answer that question. Confusing plotting aside the important takeaway is that Geillis is clearly only out for herself and likes to use people to achieve whatever her goal is. She seems to be fixated on ensuring that there is a Scottish King and employing some form of mysticism to achieve this seems to make sense for her at least. The way she is connected to so many important people and her general crafty nature make her a really interesting foil for Claire. I love the way she schemes to get what she wants from people. The episode ends on further complications for Jamie as the promise of his arrest is fulfilled. 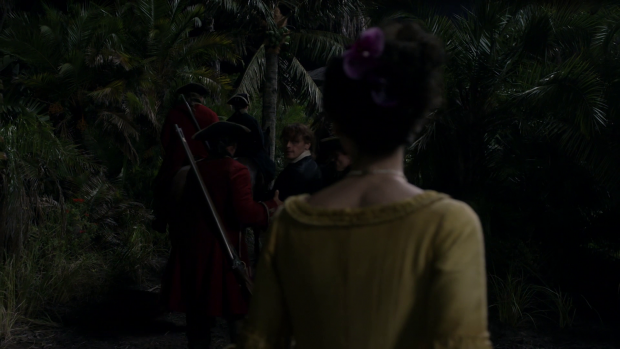 Interestingly Claire isn’t taken away for the part she played in trying to prevent him from being discovered but the plot requires her to be in a position to save him so it makes some sense. I suspect that John will be instrumental in freeing him but we shall see. It looks like the final episode of the season will be concerned with Geillis’ plan and the freeing of Jamie. A muddled yet intriguing episode that returns the format of the show back to something resembling early season 2 with something of a twist. The episode does a really good job detailing the role of slavery in Jamaica at the time and even attempts to put a human face on the problem. It’s a shame that this is clumsily handled by the end but the attempt was appreciated. 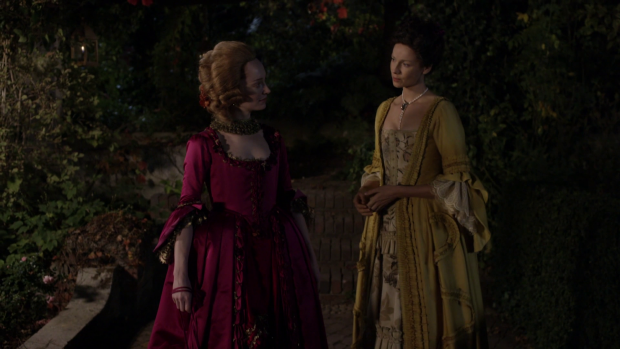 Claire and Jamie’s arrival in Jamaica means more coincidences which drags the plotting down somewhat but the reintroduction of Geillis was a welcome surprise thanks to the excellent presence of Lotte Verbeek. Geillis’ duplicitous nature is well established and the way she manipulates situations to get what she wants from people is fascinating to watch. The added sense of mysticism creates an intriguing prophecy that is likely to become the focus of the next episode as well as further her agenda to bring about another Scottish King.